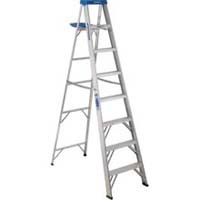 Size 6′ Reach Height 10′ Maximum Standing Ht 3’10” Load Capacity 225 lbs. Duty Rating Type II Duty Rating Performance Rating Material Aluminum Approx. Max Width 21-1/2″ Approx. Spread 41-5/8″ Pail Shelf Included Yes Spreader Material Aluminum Certifications ANSI A14.2 (2007); OSHA Approx. Cu. Ft. Per Unit 3.9.